Peaty whiskies are pretty trendy these days, and many of the top scorers find a way to add sweetness to the taste profile, whether that's the Quarter Cask, Octomore, Ardbeg Uigeadail, and so on. 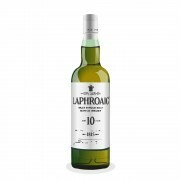 The Laphroaig 10 is classic and uncompromised, and unapologetically Islay. On the nose, iodine and peat at first. Gradually sweetens with some honey coming out but only to a point. Masters of peaty whisky can no doubt pick more out, but for me the medicinal qualities predominate. In the mouth, leather and sweat. At 10 years you aren't getting a lot of the cask. A bit of sweetness if you go looking for it but it's not why you're here. Nice, warming alcohol burn. My personal preferences are a bit towards the Lavagulin, or some of the Ardbeg stunt bottlings, or the quarter cask. But it's good to be familiar with the classic Laffy 10 so that you have a frame of reference for what some of these other bottlings are playing with. While it's a single-minded taste profile, I score this higher than I would a generic Speysider because I like drinking something that scares people off when they sniff it :). @Canadianbacon Good review, I also prefer the QC TO THE 10. This last one has more vanilla and I find the QC peat to be more meaty. So if you want a dram that will scare the beginners go for the QC, but if you want to initiate a beginner to the boldness of The young Laphroaigs choose the 10 even if it is still a scary one for the newbie. At the end, both are great values! It is nice of you to think of the beginners. Connosr had play a great role in my whisky education and it should stay a great site for the beginners and the connosrs. So, thank you for your contribution. I consider myself barely above a beginner, which is probably the reason for my interest in helping others who might be newer to this. Hopefully we'll all get to enlightenment together :).